Thank you to Swiffer for sponsoring this post. As always all opinions are my own. When our family moved back to the US this past year after a year living in England we did not have any pets. We had lost our Golden Retriever due to illness and our cat had run away while we lived in the UK. I desperately wanted to add some furry friends to our family as soon as possible! As much as I wanted to adopt a dog and cat, I do admit there was a part of me that enjoyed not having all that fur to clean up. I mean, #ShedHappens when you have pets, am I right? 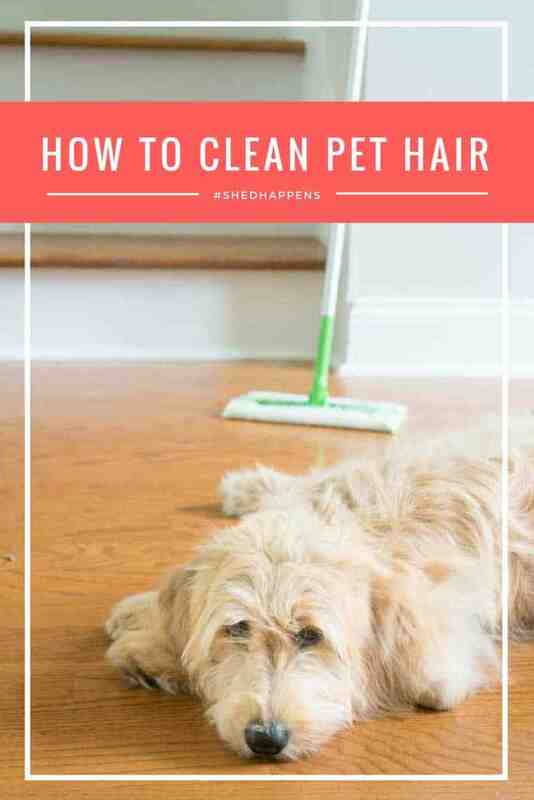 Luckily I knew how to clean pet hair easily and quickly so I could stop worrying about the mess in my home and head to the local shelter to find a new friend! Last August we added Jinx to our family, she was a rescue kitten and is an absolute riot overflowing with personality! We like to joke that she’s more dog than cat, so it was no surprise when we added our puppy Maisy to the mix two months ago they got along perfectly! They love to play chase around the house and are even known to snuggle together from time to time. Our house is definitely much happier with our new cat and dog, albeit with a little more pet hair around, of course. 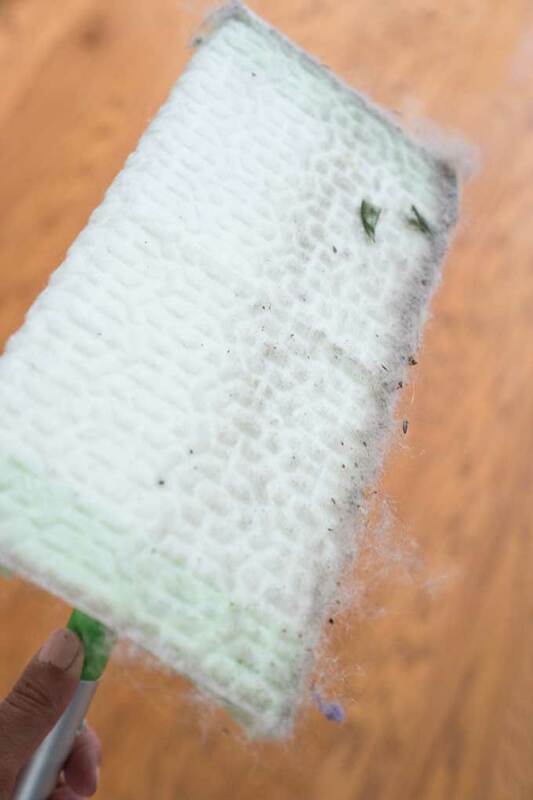 The Swiffer Sweeper dry cloth has deep ridges and grooves that lock in the dirt, dust, and hair instead of just pushing it around or into the air. This is the amount of yuck it picked up off my living room floor AFTER I had swept. See how that texture grabs everything? 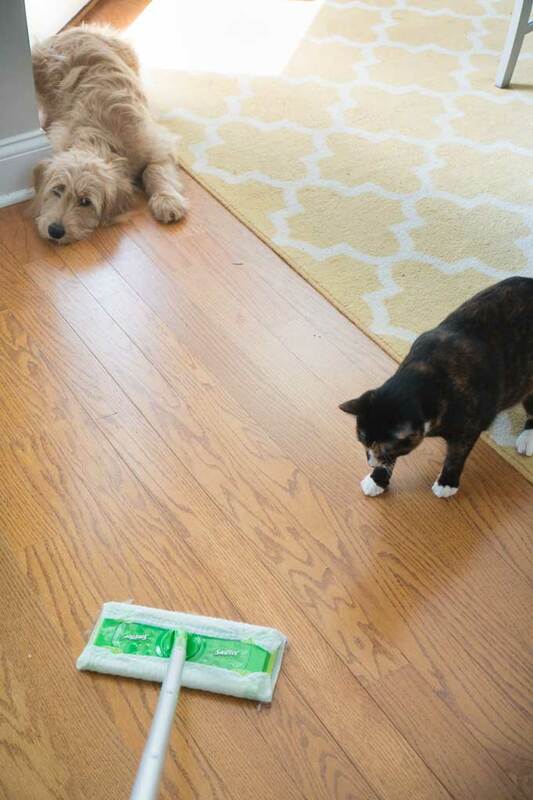 The Swiffer Sweeper is lightweight and easy to store, I keep mine in my pantry so I can grab it quickly whenever I see a mess, which tends to be multiple times a day at our house! I also keep one upstairs for my children to use because they are so affordable I didn’t mind buying two! 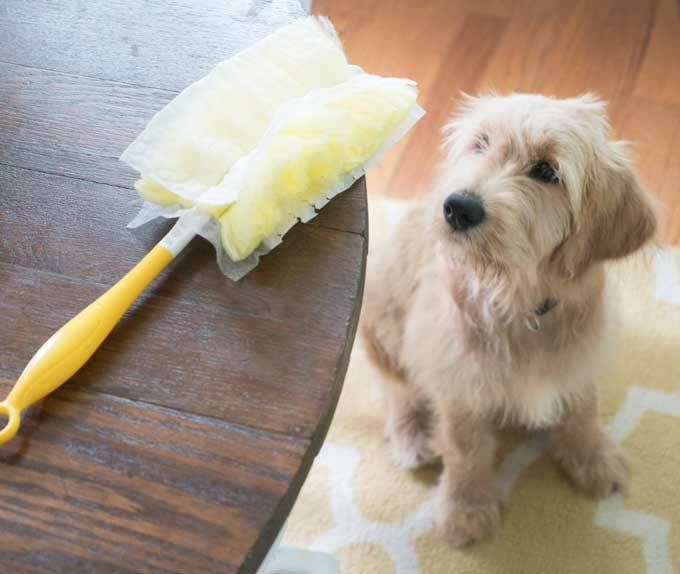 The Swiffer Dusters can fit into virtually anywhere so those little nooks and crannies hair and dust bunnies like to sneak away to are no match! Like when I find cat hair on my buffet, where Jinx is most definitely NOT supposed to be, the Swiffer Dusters can help me dust that area fast because I don’t have to move everything off the buffet, it fits in between and grabs all that pet hair and dust! Did you know May is National Pet Month? 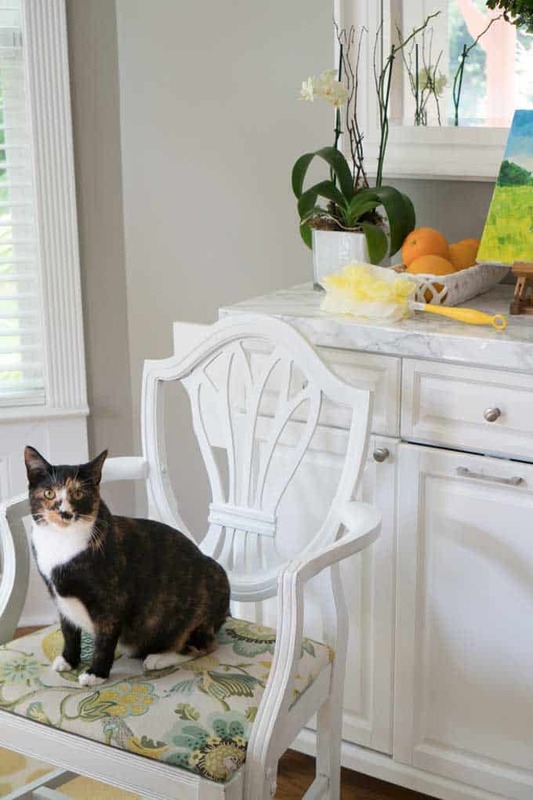 More than half of Americans have pets in their homes so that means over half of us are dealing with pet hair and keeping it under control. Luckily, it’s worth it! 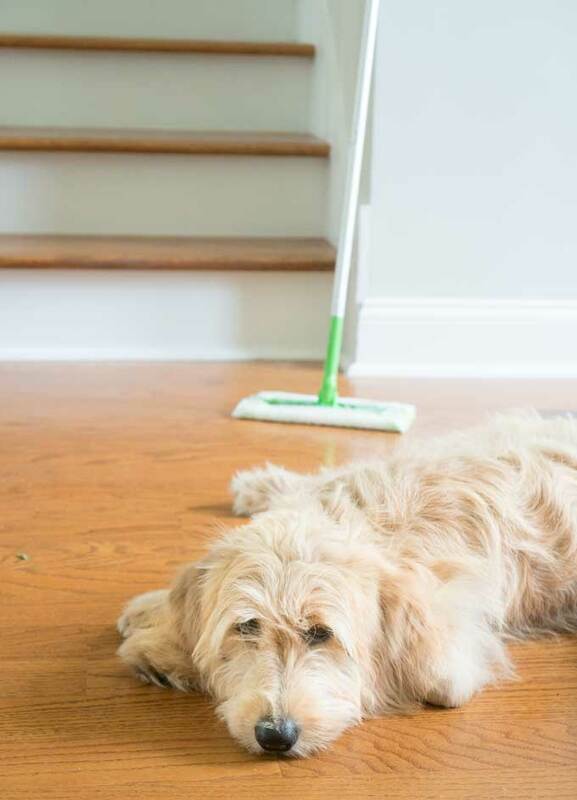 With Swiffer Sweeper and Swiffer Dusters, you can easily and quickly to tackle those messes and get back to enjoying your pet! I love my Swiffer so much!! Love that it picks up all that pet hair! Your cat and pooch are adorable! Our cat is seriously shedding right now – perfect timing! I loke your idea. You make my way easy for cleaning my pet hair. I have both the sweeper and the duster here – I have to with my pug! He drops hair no matter how much I brush him!